In a food processor, combine 1 1/2 cups flour, baking soda and salt. Pulse to combine. Add 1/2 cup cheddar cheese and frozen diced butter. Pulse until combined and the size of small peas. Add milk and process until dough holds together. Prepare a surface with remaining flour. Pat dough to a 1/2-inch thickness. Cut out 1 1/2-inch circles. Place biscuits on parchment-lined baking sheets. Bake in oven for 12-15 minutes until golden brown. Prepare cheese butter spread: Mix 1/4 cup cheese and 2 tablespoons butter. 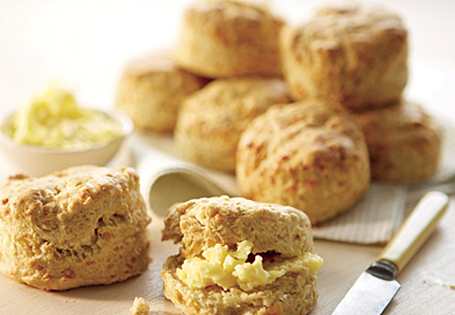 Slice biscuits in half; spread cheese mixture on biscuits.